Phew. I am now alllll caught up on posts. Having the internet back is.. well, it is basically magical. As much as I would like to think I am not a slave to the internet, I am. Everything that I like to do for 'me time' is pretty much directly linked. I know, sad, but honest. I honestly had zero plan for half moon nails. I figured I would do some leopard-esque print just on the half moon part.. then it looked lame to me.. so I leopard-i-fied everything.. added some gold dots.. it was tolerable. I should have done the light colour first.. but I didn't.. which is why you can see the dark colour still peeking out around the bottom edge.. just pretend it is not there. I do. I used OPI Miami Beet, then I did some half moon-age with OPI You're So Vain-illa. 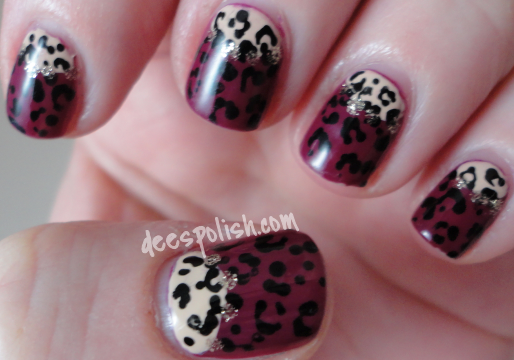 I did the leopard detail with FxFS Dark Matter and then added some gold dots with OPI My Favo(u)rite Ornament. That is all for now.. oh.. guess what is on the horizon. My arch nemesis.. water marble. At least there is galaxy nails first. Should help me remain calm!! See you all again tomorrow!! -- oh, right, and this is my 500th post! Zoiks! Nice! and Rad! All at the same time! !